It is day 9 of the 30 minus 2 days of writing hosted by Nicky and Mike of We Work For Cheese. Today's prompt is "15 minutes". Visit Nicky's page to see what the other long-suffering participants have written. It is Saturday morning, and like most mornings I woke up hungry. Only this morning is different. Not only am I hungry (we usually go out for breakfast on Saturdays), but I have nothing to offer for today's prompt. Hubby asks if it's okay if he grabs a 15-minute shower - he's playing to the prompt you see. I say fine. Now there is something you need to know, but would probably rather not because it borders on TMI, but here goes anyway. Hubby is not known for short showers, nor is he known for starting those showers upon entrance to the bathroom. If you've ever heard the expression "reading room", you have your answer, but there's more. Are you gonna brush me? Enter Sophie. Yes, the cat, or more appropriately, his cat. That is where she likes to spend quality time with her Daddy. He brushes her. Her little pink hair brush sits next to the wastebasket, and it's not unusual to find copious amounts of Sophie hair in there after brushing session. Back to the present. I am sitting on the bed with my notebook and tablet (and my cat) struggling to come up with something read-worthy on the subject of 15 minutes. I set the stopwatch function on my phone and after 25 minutes I had not heard the water start. Because he can't hear me over the fans, I get up to move things along. I say, "You said you were going to take a 15-minute shower and it's been over 25 minutes and you haven't even started." Hubby: "Well, now you've got your story"
Conclusion: He finally got his shower in the time it took me to write this, which proves he can shower in under 15 minutes, and this is what you get when I've got nothing to give. Well at least he turns the fan on. i'm forever getting in trouble for forgetting to do that. AWWW Sophie is so cute!!! What a good girl to like to get brushed. 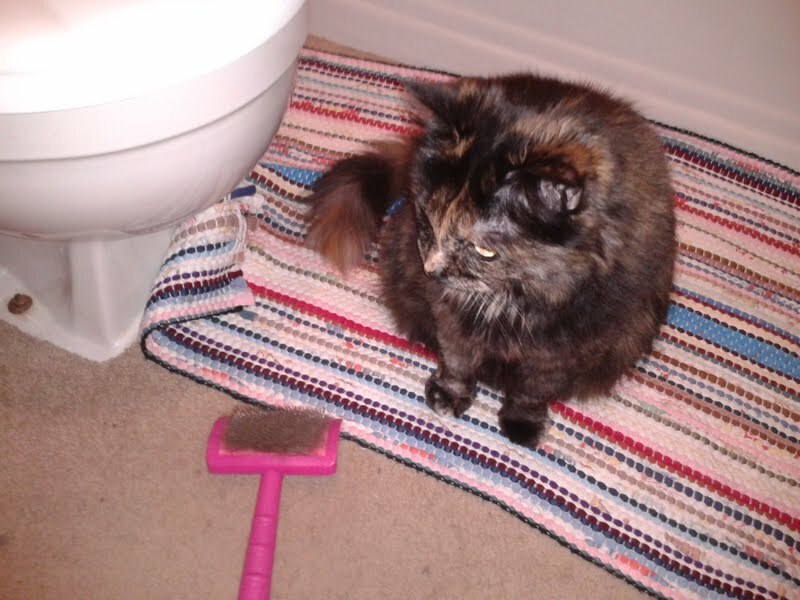 (could Sophie tell my 2 cats that brushing is a good thing). I have never timed my husband in the shower but 15 minutes wouldn't cover it. A cat in a bathroom creeps me out. I don't like being watched. Not by anything! nonamedufus- We have fan/heat unit overhead, so there are a lot of benefits of turning it on. laughingmom- No, she waits until he's done then she gets on the side of the tub and licks the water off the wall. Sometimes she even gets in the tub, leaving hair all over the place. Mariann- No, it's not conducive to non-shower activities. That's why it takes so long to complete the process. Cheryl- She will actually paw at the brush, like saying "brush me, please". P.J.- You would really be creeped out around here - we have 3 and they all like the bathroom. life in the mom lane- Thanks! Indigo- Yes, it's a beautiful thing! Nicky- I think reading rooms are a guy thing. Ziva- Oh please, write about your cat, she's adorable. Isn't it great when everything just comes together in the end? You've just reminded that I really need to brush my cats more often. I don't think I have the patience to make it a daily ritual, though. 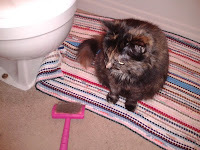 Talon- I guess the lure of the human bathroom is universal to our furry friends. K-Z.- Sophie really misses her Daddy when he's away, 'cause I don't perform the ritual. Sara- She not only stays, but loves it.